In 1995 the Russian company Sukhoi specially developed the Su-30M as a derived version of the Su-27 for the Indian Air Force. - In 2003 Malaysia ordered 18 Su-30MKM fighter jets which will delivered between 2006 and 2007. - In 2003 some Su-30MK fighters jets have been delivered to Indonesia. In 1996, India signed a contract with Sukhoi for the development and manufacturing of 8 Su-30K 2-seaters and 32 Su-30MKI multi-role 2-seaters. In 1998 the Indian Air Force ordered 10 Su-30K fighter jets more. They have been delivered in different versions with other avionics, engines and weapon systems. The Su-30K is the basic version, the 18 Su-30K fighter jets will be updated to the Su-30MKI version. 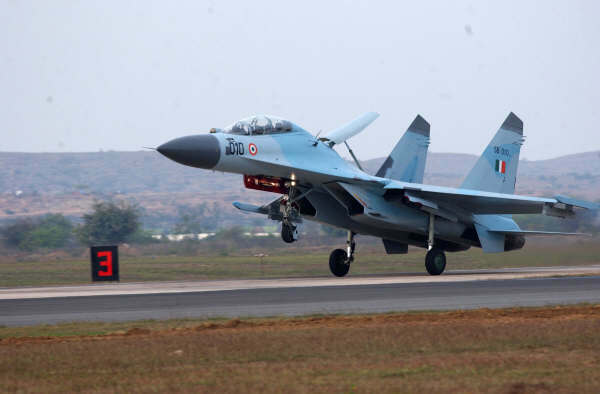 For test-flights have been manufactured 2 prototypes and 3 Su-30MKI pre-production aircraft. Since 2000 the Su-30 is in production at the Sukhoi plant Irkutsk. They have been delivered in 3 periods. In 2002 was the first delivering of 10 Su-30 Aircraft to India. In 2003 was the second delivering which included 12 Su-30 aircraft. In 2004 the delivering of all 32 Su-30MKI and 18 Su-30K fighter jets was complete. They came operational by 2 squadrons of the IAF. In 2000 the India Air Force ordered 140 Su-30MKI fighter jets more. Under a licence of Sukhoi the 140 fighter jets will be manufactured by the Indian company Hindustani Aeronautics (HAL). They will be delivered between 2003 and 2010 to the IAF. The total Indian orders are still growing with now 234 Su-30MKI's on order. The Su-30MKI will replace aircraft like the MiG-21FL and the MiG-27ML. De Su-30MKI straaljagers hebben draaibare straalpijpen (AL-31FP) die de beweegbaarheid van het vliegtuigen vergroten. De integratie van avionica is ontwikkeld door 14 buitenlandse bedrijven uit 6 verschillende landen. De radar is ontworpen door het Wetenschappelijk Onderzoeks Instituut van Instrumentatie Technologie. De schietstoel is van het type K-36D-3.5. De Su-30 kan worden uitgerust met bommen als de RVV-AYe lucht-lucht raket, Kh-29L/T/TYe, Kh-31A/P, Kh-59M lucht-grond raketten en de KAB-500 en KAB-1500 geleide bommen. In 1997, Sukhoi design company started with the development of the 2-seater Su-30 attack fighter jet for the Chinese Air Force. The Su-30MKK is a derived version of the SU-27SK and Su-27M. Many parts haven't been change from the origin design, parts like: central wing space, wing panels, air-intakes, shadow beams, fins and landing gear and the Su-27SK fuselage. Only components for the nose have been new developed. Due to this the develop time reduced a lot. Also the production of the fighter jets because the plant had already experience with manufacturing of a 2-seat trainer. The prototypes have been manufactured by the Komsomolsk-on-Amur plant. The first prototype flow on 20 May 1999. 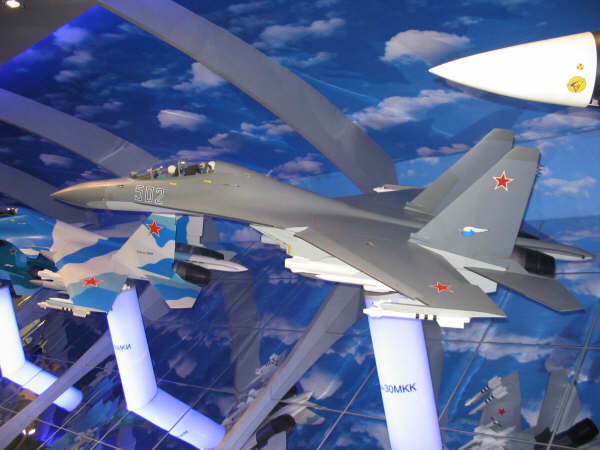 The first 10 Su-30MKK aircraft were delivered to the Chinese Air Force in december 2000. China has ordered 38 Su-30MKK and 24 Su-30MK2 fighter jets. The Su-30MK2 is modified version of the Su-30MKK. They are difference in weapon systems ad equipment systems. These Su-30MK2 aircraft were delivered to China in 2003.